We went to an unusual Bar opening this Saturday 27 June. 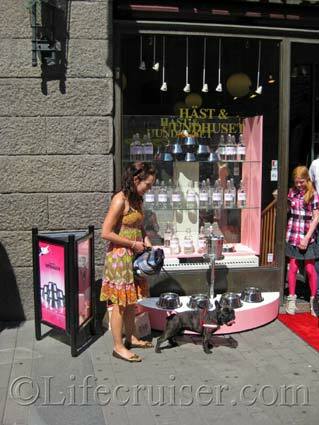 Stockholms 1st bar for dogs had premiere opening at the Horse and Dog Shop “Häst och Hund”, Kungsgatan 28. Water, snacks & hopefully no bar fights? Sounds crazy? Yes, we thought so too and that’s why we went there to check it out. We welcome all such wonderful ideas. Really creative. It required a blog post, right? The bar was exactly right: our hot summer weather demands drinks – and the bar were placed in convenient nose height. The snacks obviously smelled delicious because most of the dogs followed the smell right into the shop where they were placed. Not so surprising, since the were Canapes composed by the wellknown restaurant Sturehof’s star Chief Felix Netzell. 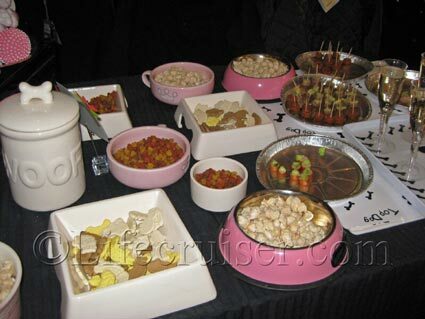 But surprisingly enough, the dogs seemed to be more interested in the snacks and to have doggy bags with them, than to actually have a drink at the bar…. That is wonderful! All my dogs and puppies would love it! Even the love sick one! Hope they have an age limit for the doggies. Can’t let underage puppies in, getting drunk and all. It’s a nice idea – during Summertime.